Epidemiological studies suggest that dietary factors play an important role in the etiology of cancer at many different sites (Correa, 1981; Doll and Peto, 1981). For example, high levels of legumes in the diet have been associated with lower overall cancer rates and are inversely correlated with the incidence of breast, colon, pancreatic, and prostate cancer (Mills et al., 1988; Phillips, 1975). Legumes are known to contain high concentrations of protease inhibitors (Birk, 1975). Several laboratories have reported that protease inhibitors are effective suppressors of radiation- and chemical carcinogen-induced transformation in vitro and in vivo (reviewed by Kennedy and Billings, 1987; Troll et al., 1984). For example, the soybean-derived Bowman-Birk protease inhibitor (BBI) (Birk, 1985) has been shown to suppress DMH-induced colon and liver carcinogenesis in mice (Billings et al., 1990b; St. Clair et al., 1990; Weed et al., 1985) and DMBA-induced cheek pouch carcinogenesis in hamsters (Messadi et al., 1986). In addition, BBI as well as several other protease inhibitors will suppress chemical- and radiation-induced transformation of mouse embryo fibroblast cells in vitro (Baturay and Kennedy, 1986; Yavelow et al., 1985). Protease inhibitors have also been shown to inhibit the transformation of NIH 3T3 cells brought about by transfection of an activated ras gene (Garte et al., 1987). 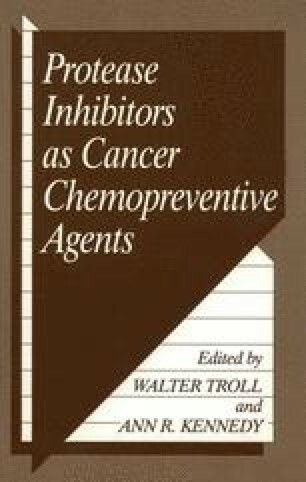 Although the mechanisms by which protease inhibitors suppress carcinogenesis are not fully understood, we believe that these compounds exert their anticarcinogenic effects by inhibiting one or more enzymatic activities involved in the induction and/or expression of the transformed phenotype (Billings et al., 1987a, 1988, 1990a). Consequently, in addition to being potent anticarcinogenic agents, protease inhibitors should be useful biochemical tools for identifying cellular enzymes involved in carcinogenesis. about by transfection of an activated ras gene (Garte et al., 1987). Although the mechanisms by which protease inhibitors suppress carcinogenesis are not fully understood, we believe that these compounds exert their anticarcinogenic effects by inhibiting one or more enzymatic activities involved in the induction and/or expression of the transformed phenotype (Billings et al., 1987a, 1988, 1990a). Consequently, in addition to being potent anticarcinogenic agents, protease inhibitors should be useful biochemical tools for identifying cellular enzymes involved in carcinogenesis.